When will opera directors learn that less is invariably more? In the 1950s the actor-manager Brian Rix developed a genre of comedy known as Whitehall farce. The main characteristic of this peculiarly English art form was frantic stage business involving a lot of doors. And judging by the six doors and endless comings and goings in English Touring Opera's new production of Mozart's The Magic Flute, which played at Snape yesterday, we may be about to experience a revival of the Whitehall farce. This new Magic Flute is directed by, and I quote English Touring Opera's website, "phyical theatre specialist Liam Steel". So it was hardly surprising that the production was more theatre music than music theatre. But this meant that fleeting moments of magic battled against a noisy set that was part lighting showroom (see header photo) and part TV game show. Musically, things under conductor Paul McGrath were equally patchy, despite an outstanding Queen of the Night from Laure Meloy. And was an electronic keyboard in a Mozart opera at Snape a sound of the times, or just a sound of the technology? 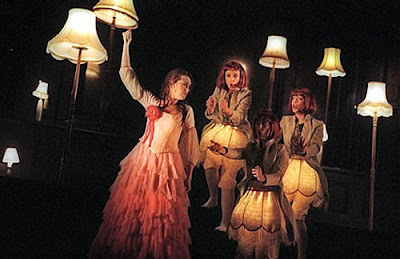 English Touring Opera work on restricted budgets, and do a fantastic job of taking English language opera to the places that more prestigous companies do not reach. For this reason they invariably receive a positive press. But, I am afraid, this time I am putting the final score at Physical Theatre 5 - Mozart 1.